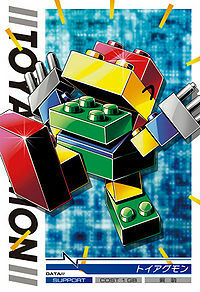 A unique Digimon whose entire body is made up of unique plastic blocks. It is said that a child playing on the Internet created it by imitating Agumon's appearance, so it is very cute. 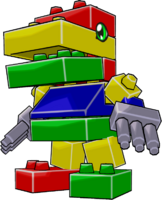 Unlike the confident Agumon, it has a cowardly side and its blocks fall apart into pieces when it is surprised. However, it possesses a righteous heart that doesn't condone evil. Also, since it absolutely loves children, it enjoys communicating with them over the Net. 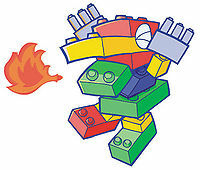 Its Special Move is firing a flame-shaped toy missile (Toy Flame). It is fairly powerful. 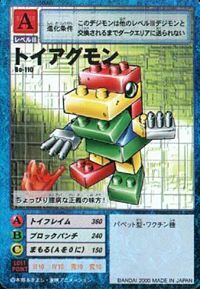 A puppet Digimon whose entire body is made up of blocks. It is said that a child playing on the Internet created it by imitating Agumon. It has a strong sense of justice, and doesn't forgive evil. Since it loves children, it enjoys chatting with children from around the world on the Net. It is said that its blocks fall apart into pieces when it is surprised, so it is a bit of a coward sometimes. 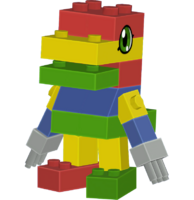 A Digimon said to be created by a child playing on the Internet imitating Agumon. Although its personality is cowardly, it also possesses a righteous heart that doesn't condone evil. It loves communicating with children on the Net. 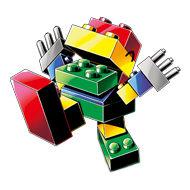 The blocks of its body fall apart into pieces when it is surprised. Anime/Manga Digimon Frontier: "Town Floating in the Sky! Toy Agumon Toy Country"
トイフレイム Toi Fureimu Plastic Blaze/Toy Flame Fires a flame-shaped toy missile. 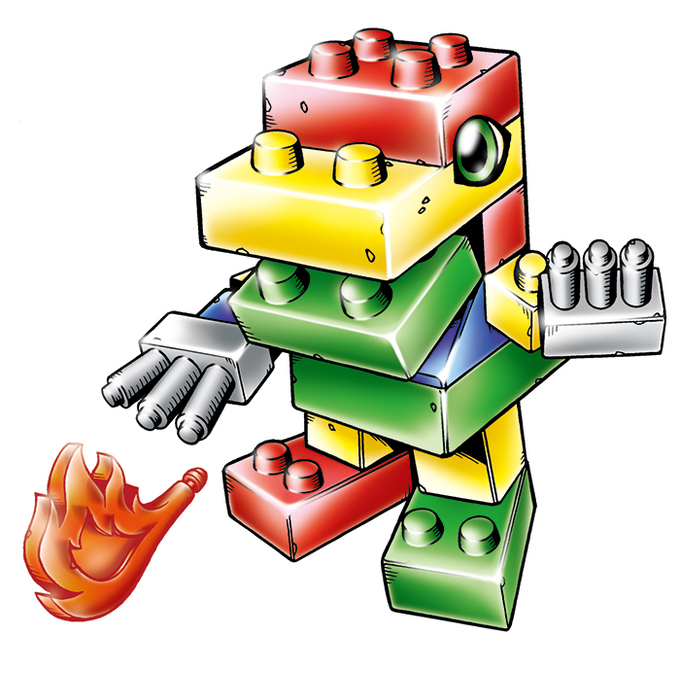 Punches the enemy, sometimes causing a pillar of fire. Surrounds self with miniature stars before throwing a large star. ベビーフレイム Bebī Fureimu Pepper Breath Releases a stream of fire from its mouth. マリオンパンチ Marion Panchi Million Punches/Marion Punch Hits the enemy with a spinning, flaming punch, or punches to shoot a ball of fire. Toy Agumon (with Pandamon) from Digimon Frontier. First appeared in Digimon Frontier - Episode 07. As Tooru explains about the Net Battle, a Toy Agumon and its Tamer are seen in the background. 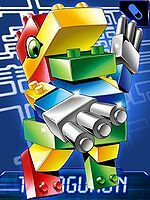 Toy Agumon is an unobtainable enemy Digimon found in Toy Town. It is only obtainable as a collectible card. Toy Agumon appears as a Yellow Card. Toy Agumon evolves to Leomon (0-2 DP) or Tailmon (3+ DP). Toy Agumon is an obtainable Digimon. Can be evolved from Koromon. 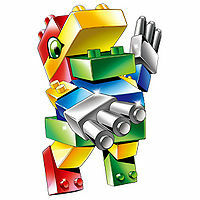 Toy Agumon is an available Mercenary Digimon, being classified as both a Child and Perfect level Digimon. There is no difference between its forms minus increased stats. 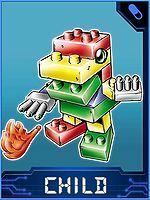 Toy Agumon can only be obtained as a collectible card. 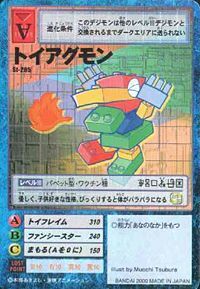 Its card is part of the Agumon Eight (アグモンエイト, Agumon Eito) set and the From Toy Land (おもちゃの国から, Omocha no Kuni Kara) set. Evolves from Caprimon. Can evolve to Greymon, Revolmon, Tankmon or Clockmon. Evolves from Caprimon. Can evolve to Greymon, Revolmon, Thunderballmon or Clockmon. Appears in Area 01 as a wild enemy encounter. A kind, child-loving character. When it is surprised, its body falls apart. A slightly cowardly supporter of justice! 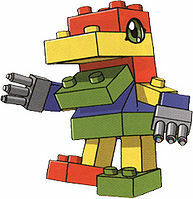 A Digimon whose entire body is made of plastic blocks. Although it was modeled based on Agumon, it completely lacks courage and sports a cowardly personality. Its body falls apart when it gets surprised. ↑ Digimon Frontier: "Town Floating in the Sky! Toy Country of Toy Agumon"
This page was last modified on 6 April 2019, at 05:52.